Dontech has introduced the Therma Klear Flex™ series of thin flexible transparent heaters for use in outdoor, military or avionic applications. Therma Klear Flex™ transparent heaters provide the warmth necessary to extend the operating temperature of liquid crystal displays (LCDs) in cold environments (0° to below -40°C) and for anti-fog, anti-icing, and de-icing of optics, sensors and display assemblies. Applications include avionics displays, vehicle displays, mobile computers, kiosks, and handheld devices. Custom sizes are available up to a 24 inch diagonal. Heaters can be supplied with an optical grade pressure sensitive adhesive for optical coupling purposes. Therma Klear Flex™ heaters are constructed utilizing Dontech’s VCF Series™ visually transparent conductive coatings applied to flexible optical grade polyester. Custom substrates are available. 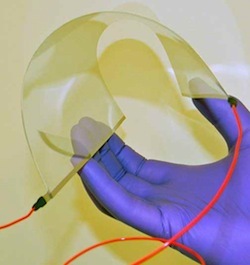 The conductive coatings are single or multiple-layer, thin film deposited coatings with a resistance from 5 to 200 ohms/sq. When an electrical current flows through the coating, the filter will generate heat. The heaters are typically 0.007″ in thickness, require very little room and are easily integrated into most mechanical footprints. With dielectric enhancements, light transmission of Therma Klear Flex™ heaters can exceed 90%, allowing for minimal degradation to the optical performance of the assembly. Dontech’s proprietary lead wire attachment method is exceptionally durable for custom mechanical and electrical configurations, as well as EMI/RFI attenuation. Recommended power settings are from 0.1 to 1.0 watts per square inch.